Welcome To Day 18 Of Baking With Pumpkin! Today was a fun but busy and exhausting day for me! I went apple picking for the first time here in Japan. It was supposed to be with my husband and his Command but since he was on duty I still went. I was expecting it to be much cooler up in the mountains but really the day warmed up a bit more than anyone thought it would. We were all actually hot and sweaty, especially after having to walk up very steep inclines and such to get to the apple orchard. It sure was interesting! The day really ended up nice though. I did pick enough apples for maybe 2 apples pies and I bought some apple juice they make right there. It is fresh! Today’s recipe is something I actually made a while ago but somehow forgot to post it and since I was super busy today with no time for baking I decided I would share it with you. 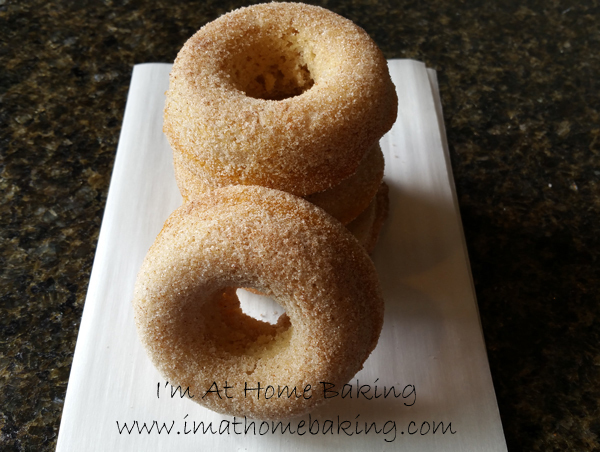 These baked donuts are very cakey, moist and delicious. Not like some baked donuts that turn out dry and crumbly. 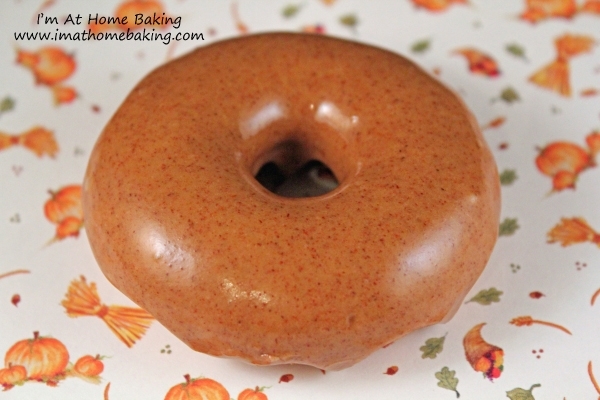 These are wonderful, with or without the glaze and will have everyone coming back for more! Preheat the oven to 350 degrees. Coat a donut pan with cooking spray. Combine the flour, baking powder, salt, baking soda, cinnamon, nutmeg, ginger, and cloves together until well combined. In another large bowl, cream together with a mixer, the brown sugar, butter, and pumpkin. Add in the milk, eggs, and vanilla then mix well. Slowly stir in the dry ingredients until just combined. Place the mixture into a large zip lock bag. Cut off the corner and pipe evenly into the donut pan. Place into the oven and bake for 13-15 minutes or until a tester inserted in the center comes out clean. Remove pan from the oven, let rest for 5 minutes before placing on a wire rack to cool completely. Meanwhile make the glaze. Combine the powdered sugar, maple extract, cinnamon, maple syrup (optional), and milk together until well combined. Place some wax paper under the wire rack. Dip the top of the cooled donuts in the glaze then return to the wire rack to allow the glaze to set. It seems to me that recently donuts, baked donuts are all the rage these days! I came across them on accident really, reading all my baking blogs I follow. I though, GREAT, just great…another pan I must have! This seems to happen to me more and more, every year. 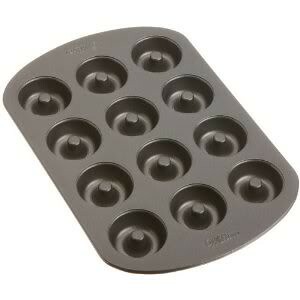 I know it is not a necessity to have such pans because there is such thing as yeast donuts. Of course you could argue that baked donuts are healthier, therefore you *need* this pan. Just seeing all those cute, little, colorful minis made my head spin. Of course you can also purchase the normal size pan but if you read my blog, you know I bake for hubby to take stuff to work to give to everyone, especially the single sailors, so mini is perfect, portioned and practical. So, I ordered one pan from Amazon, Incase you are wondering, I am not being paid or compensated to write any of this, this is my own free doing. I have a suggestion though, if you purchase one of these, you might as well go and purchase a 2nd one too. Most of the donut batches make 4+ dozen, so it will move quicker having two. I tried this pan out the other day with a test batch and I had awesome results. I just ended up ordering a 2nd pan and well, one of the regular size donut pans. I guess it might have made sense to purchase two regular ones as well but first I want to try it out and see if it is worth me purchasing another one. I did not try the recipe that comes with the pan yet. I tried one I found on Pinterest and it was very good, could have used a tad more flavor but it was just a basic vanilla. I was very curious as to how long to bake them. You will find most recipes say….way to long for my oven at least! The first dozen I made came out beautiful but well done, more done that I wanted. I had baked them as long as the recipe said. For my oven it was way to long and I ended up baking the rest for only 5 minutes and did not leave them in the pan for another 4-5 minutes, I immediately removed them from the pan onto a wire rack. Another suggestion, if you are wanting to make a plain vanilla glaze and want it to be bright white, don’t use regular vanilla extract, you will have to use the clear one or it will look more like a maple color. I imagine it would not matter if you color the glaze. In other news, I’ve been busy…hence my absence here, which I am not thrilled about. Already almost 5 days into March and my last post was the 27th of last month. Work will do that to you though! I am hoping to get some more baking in this week though as I am only working 1 day this week! We are having strange weather here. I am not sure if winter is trying to wrap up or make a slow exit. We did get a little more snow this weekend and it snowed a little today, a few days before that it was in the 40’s melting the feet of snow on the ground. I’d prefer it to stick around for a while longer.